After reaffirming the safety of U.S. nuclear facilities, establishing a framework to respond to Fukushima Daiichi and creating a basis for action, the nuclear energy industry developed a diverse, flexible approach to implement the lessons learned from Fukushima Daiichi and address Nuclear Regulatory Commission recommendations. The diverse and flexible coping capability, or “FLEX,” builds on earlier safety steps by providing an effective and efficient way to make U.S. nuclear energy facilities even safer. FLEX is a major step in addressing the critical problems encountered at Fukushima Daiichi: loss of power and reactor cooling capability. It provides an additional layer of backup power after an extreme event by stationing vital emergency equipment—generators, battery packs, pumps, air compressors and battery chargers—in multiple locations. Implementing FLEX will help maintain cooling if normal systems and other backup systems fail by stationing additional pumps and power sources in multiple locations to provide cooling water to the reactors. To provide yet another layer of protection, the FLEX approach will also maintain safety even after a catastrophic event by stationing emergency equipment in secure offsite locations. The reinforcement equipment can be used if all of the plant backup equipment is insufficient. This approach builds on concepts that were used successfully to enhance safety at U.S. nuclear energy facilities after the 9/11 attacks, when the nuclear industry had to analyze how to mitigate potential terrorist attacks. Because the FLEX strategy relies on diverse and multiple emergency assets, it provides protection even for the most unlikely events that exceed a plant’s design envelop. 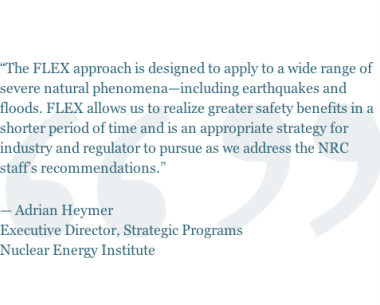 The FLEX approach is a faster, more efficient and effective way to address issues that the NRC and the industry have identified as the top priorities after Fukushima Daiichi.